If you’re remodeling your kitchen, and part of the plan is to get new kitchen cabinets, you’re probably going to be doing some research into what your options are. Part of that research is going to be figuring out what kind of quality you want within the budget that you’re allocating for yourself. There are a few ways to determine just what kind of condition and quality you’re going for, and these are three of the ones to keep an eye out for. The gliders are the mounts for the drawers built into the cabinets that control the motion of the drawers as you they are pulled out and pushed back in. Depending on how much you’re willing to spend, the gliders can be as simple as plastic that slides in and out, or metal fixtures, with rollers that provide a smooth, easy, silent motion. You have many options here, including “soft close” features that can prevent slamming, so make sure you look at—and try—your various glider choices to see which ones you like best. Most kitchen cabinets are going to be made with either plywood or particle board, and that choice will affect the durability of the cabinet, especially with regards to deformation. Plywood means that entire layers of solid wood have piled on top of one another, and this is generally viewed as the more durable choice. Particle board is cheaper, and has a good lifespan, but is more delicate, and can chip, bend or deform easier than plywood. This is a big indicator of quality. 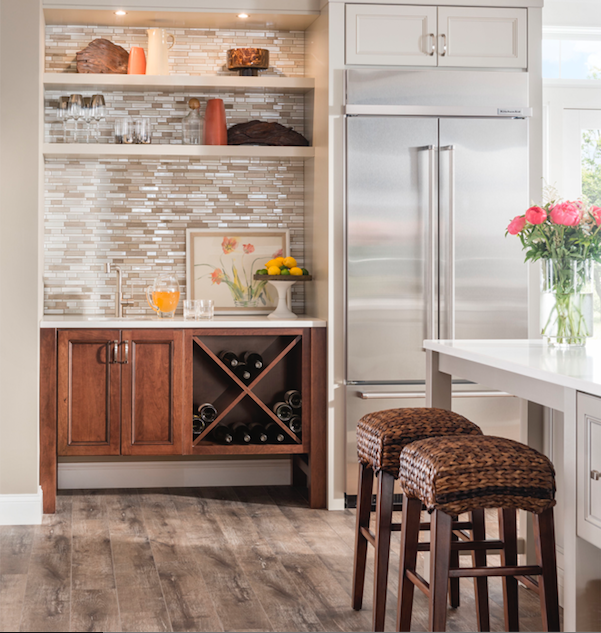 When you pay more for cabinets, you may get a lifetime guarantee on that product, because the manufacturers are reasonably confident that, with proper care, the cabinets will last a lifetime. When you get no guarantee or warranty at all about the condition of cabinets, that’s a warning that this may not last as long as you’d like.